Your Sinfully Black color. No need to repent! Be proud of. Indulge your guilty pleasures with this deviously dark. your dark, rich color! 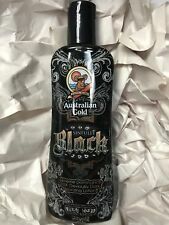 Sinfully Black Accelerator / Bronzer Tanning Lotion Item Description Description: Australian Gold Sinfully Black 15x Dark Bronzer Product Actions: Tan Enhancer, Bronzer Size: 8.5 oz (250ml) Fragrance: Temptuous Berry Directions: Apply liberally prior to indoor tanning. Wash hands after applying lotion Payment Details ---We prefer PayPal as our method of payment. ---PayPal can process all major credit cards. ---If you are purchasing multiple items, please make sure you pay for them together on the same invoice so that all shipping can be combined for the lowest shipping price to you. Shipping Details ---Standard Shipping for this item is free anywhere in the U.S. including Alaska & Hawaii ---Items are shipped out Monday - Friday from 10am - 3pm EST. ---Regular Mail is a 3-6 day service.